Discussion in 'One Piece News Central' started by Mr. Kishido, Jul 2, 2017. This year's 31st issue of Shueisha's Weekly Shonen Jump magazine on Monday is teasing that Eiichiro Oda's One Piece franchise is getting 10 "big projects" for the manga's 20th anniversary. The magazine's 33rd issue on July 15 will feature announcements regarding the 10 projects. The manga's official 20th anniversary is on July 22, and so the 33rd issue of Weekly Shonen Jump will be the manga's 20th anniversary commemoration issue. The 31st issue also teases that something will happen on July 22. KoyoteIcarus, RobertoTheOharaSurvivor, dr. Jazz and 9 others like this. Maybe oda finally decide to give us a Spin off that's what i want tbh for the 20th of OP ... A spin off one Dragon , Roger , Ace , WB , BB even anything in the past so we don't get spoiled in anything for now ..
Outside of the manga proper they are really making a big deal of the 20th anniversary. And that's a good thing. Oda must be really happy that WSJ is doing all sorts to show their appreciation and celebrate this milestone for him and with him. Weekly Shonen Jump from this week announced 10 Big Projects for One Piece 20th Anniversary. Thanks YonkouProductions for translation. Icecream001, KoyoteIcarus, RobertoTheOharaSurvivor and 1 other person like this. This is anniversary celebration event summary in a special Weekly Jump edition in commemoration of 20th Anniversary of One Piece. Fan illustrations will be used on the cover together with Luffy. A report on the shop that was used as a model in "Susume! Jyampu Heppoko Tankeitai!" which is published on "Jump+". The official website one-piece.com will get renewed. There will also be a special site open for the anniversary. "Tokyo Pirates Festival" will open at the Tokyo Tower. 20th Anniversary Events on OPTC, OPTS and Grand Collection. To celebrate the 20th Anniversary, "The Untimate" One Piece game has been announced that is in development right now. Collaboration events with Twitter and Line. SNOW will have a special One Piece mask. One Piece manga vol 1 - 60 will be made available for online viewing, for free (for a limited time). "One Piece Magazine Vol.1" now no sale. Charlotte Pepper, RobertoTheOharaSurvivor, Nitwit and 5 others like this. Ghost9, RobertoTheOharaSurvivor, Nitwit and 3 others like this. I hope that game has a massive roster. RobertoTheOharaSurvivor, Nitwit, AL. and 1 other person like this. I want Cracker and Katakuri playable so badly! I hope it'll be held in Paris too. And I really wanna read this Ace novel.. It's gonna be fire! Oh yes.. Although I'm not really into video games, I wouldn't refuse that..
RobertoTheOharaSurvivor, Nitwit and dizzy2341 like this. That is actually amazing! Crazy hype! Maybe we might get some tiny hints on Shanks' powers considering Oda is working on it. Icecream001, RobertoTheOharaSurvivor, Nitwit and 1 other person like this. zazen and RobertoTheOharaSurvivor like this. Will it be a fighting game or an adventure/open world game? Either way, the hype is REAL!!!!! So were these two lists for two different things? Or is one of them false? The one I posted here is from reliable source , YonkouProductions that is. Yikes, I think we should lower our expectations for that ultimate One Piece anniversary video game. Especially for an open world game, you can't expect a huge roster. Even though Dynasty Warriors 9 is going to be open world with over 80+ playable characters, that's only because Omega Force has been developing Dynasty Warriors games for so many years. So, if Ganbarion is the developers, then yes expect tons of characters because they have been developing One Piece games for so many years. Another thing is not to expect the Whole Cake Island arc to be part of this (Unless DLC or you are okay with madeup story) project because it's not finished yet and it's stated Project Dawn was in already in development. 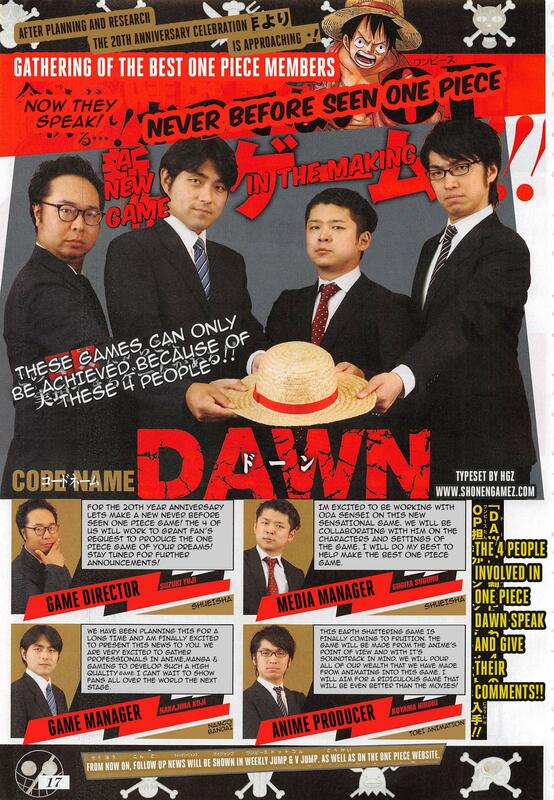 Not to mention, even the title "Project Dawn" tells you what the game might be mostly covered. This game might be a better version of One Piece Romance Dawn for consoles. And since Oda is taking the major lead of this project this could possibly mean a side story like One Piece Unlimited games which will be bad for new fans trying to understand One Piece (Unless they don't care, just like open world games, and don't feel like watching/reading 700+/800+ chapters) or from beginning to Dressora which will be good to get new fans into One Piece. Spoiler: The game is called "Project Dawn"
Spoiler: All the One Piece companies who support One Piece games will be supporting this. The game will feature the talents of One Piece anime producer Hiroki Koyama from Toei Animation, One Piece media supervisor Suguru Sugita from Shueisha, One Piece game supervisor Yuji Suzuki from Shueisha, and One Piece game producer Kōji Nakajima from Bandai Namco Entertainment. Shueisha will reveal more news about the game in Weekly Shonen Jump, V Jump, and on One Piece's official website. Spoiler: These games can only be achieved because of these 4 people!!! The only thing we don't know is the developers of this project. We will find out more information this upcoming week in the V Jump magazine and website.